Romania, which had four days off a year when I immigrated here, now has more holidays than I can count. A hot beautiful four day holiday just came to an end. We spent the 'mini-vacation' in Sibiu and drove as far as Hunedoara Castle. It was my first visit, but a dauntingly long queue put us off. We returned mid-afternoon but the queue still looked an hour long and we drove on. Ceausescu built a belching iron works next to the castle of John of Hunedoara, to show the victory of socialism over monarchy and the old order, but the works has been demolished, putting many out of work and the castle remains, the mainstay of the town's economy. Tourism has replaced iron and steel as the engine of economic growth. We grow rich by taking in one another's washing. There is a copy of the castle in in the City Park in Budapest, built in 1896 as part of the Millennial Exhibition which celebrated one thousand years of Hungary's existence. 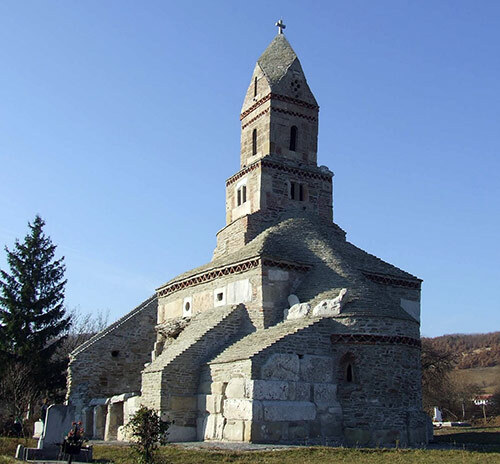 We then went to Densuș, the oldest church in Romania, which was originally built in fourth century as the mausoleum of a Roman general. It is beautiful, unlike any other church in the country and resembles slightly an Armenian church. W.C. Field said that he went to New Zealand but it was closed. So was the church. We were not having much luck but, like the castle, it was magnificent from outside. We did manage the ruins of the Roman site of Sarmizegetusa, which reminded me of the Russian towns I recently visited in Central Asia. The Russians built opera houses and the Romans colosseums where gladiatorial combats took place. Both considered that they were spreading civilisation. My companion (as they say in restaurant reviews) wondered if the ruins were built by the Communists to prove that Romania predated Hungary. I think that was unduly suspicious but I don't really know. It would be a good story. Below is Keneffy castle. Built in 1782, in a sort of Hungarian version of the Strawberry Hill Gothic, after the revolution it was made into a hotel but is now deserted and closed up. Very Scooby Doo. Gentle reader, why don't you buy it? On the subject of a setting for a Scooby Doo episode, here is Medias(ch) synagogue. The German army was here in the war and took over the Jewish school but, since Medias remained during the war in Romania and not under German or Hungarian occupation, they could not harm the Jews of the town. Only three Jews are left there now. Almost all the rest are in the Holy Land, where they went in return for payments to Communist Romania by the Israeli government. The display in the museum included testimonies from Jews who were in Medias in the war. The German soldiers, so one Jewish woman from Medias remembered, were gentlemanly and friendly, but the Jews were ill treated by the local Iron Guard. The iron works was built in the 19th century (started in 1882), many moons before Ceausescu was even born. I find you mentioning Scooby Doo funny (though not really surprising).